This is just a quick note on something that may only interest me. 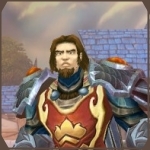 Anyway, for most of the past three years or so, since I started playing, if you searched “Gavelier” on the WoW Armory, you got me. Period. That was it, I was the world’s only Gavelier. Now, for the first time I can recall, there’s a new Gav on the block. Gavelier, a Tauren retribution paladin on another server has come to my attention. I would love to take credit for the name or being their inspiration (what with them being a ret pally as well) I don’t think that’s the case. In any event, the world’s big enough for way more then two Gaveliers. I welcome all namesakes. As a side note, the new Gavelier is in my battlegroup (Emberstorm) so maybe we’ll meet in a battleground someday. Maybe.